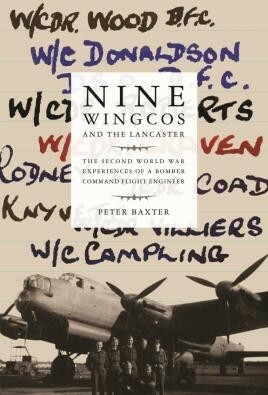 Flight engineer Peter Baxter's Second World War account of 34 bombing operations in Lancasters, flying with nine wing commanders. Bomber Command flight engineer Peter Baxter completed thirty-four operations during the Second World War, and following his first tour with No. 12 Squadron he became the Engineer Leader for the new formed No. 153 Squadron. During his 400 hours in the air, half of which were at night, he flew with a succession of pilots including nine Wing Commanders. After passing the entrance examination in November 1937, Peter entered the Royal Air Force Technical Apprentices School at Halton, near Aylesbury, Buckinghamshire, and over the next few years Peter learnt his trade at RAF stations Halton, Cosford, and Penhros. In 1942 the opportunity arose for Peter to become aircrew, with the RAF's new four-engine heavy bombers requiring a designated airman, the flight engineer, to take care of the aircraft's various mechanical, hydraulic, electrical and fuel systems. Peter takes up such duties, flying the iconic Avro Lancaster, when Bomber Command is about to enter one of the most intense air campaigns of the war, the 1943 Battle of the Ruhr. In 'Nine Wingcos and the Lancaster' the author describes in remarkable detail not only his RAF experiences but also the environment in which he lived, the friendships made, and the rigours of firstly working on aircraft in all conditions as groundcrew, and then as an airman struggling to fly, fight and survive amidst the attrition of the air battle over Germany. Illustrated with previously unpublished photographs Peter Baxter's account is also a must for all technical enthusiasts, with comprehensive sections on the mechanics of the Avro Lancaster and how it is flown.